Friends will easily look at the evening's pictures or snapshots of the family outing on the 2.0 inch TFT colour display. CASIO's sophisticated electronics has enabled a considerable reduction in energy consumption, allowing the photographer to record even more moments than before. This improvement also provides high-quality photos in conditions where the light intensity is low. Not least, taking pictures is easy with the new QV-R51 and QV-R41 from CASIO in their high-grade, compact metal casings due to their simple menu operation. In addition to the 21 motif programmes (BESTSHOT), which can be individually supplemented, it also has a self-timer, macro, automatic calendar and world-time as well as an alarm with picture and sound function. The photos are stored in the 9.7 MB memory, which can be expanded by any SD/MMC card. When the 168g-lightweight is not needed, simply press the "Direct-Off" button and it switches itself off as quickly as on again. The multi-talent with the measurements 88.3×60.4×33.4 mm with its technical innovations is guaranteed a real eye-catcher everywhere. 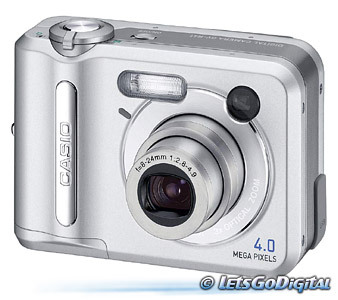 The new CASIO QV-R51 digital camera will be on sale from the end of January 2004 at specialist retailers for € 449.00 (recommended retail price). The QV-R41 is available from the end of February 2004 at a price of € 399.00. High-performance storage batteries, hand strap, USB cable as well as a comprehensive range of software on CD-ROM are also included. The camera bags QVR-CASE1, QVR-CASE2 and the mains adapter AD-C30 are optionally available.